You save money and natural resources when you live at The Carter, a LEED Gold Certified property. At our Redmond, WA apartment community we use less water, less energy and fewer greenhouse gas emissions mean lower utility bills and knowing that you’re doing your part to protect our planet. Publicly Accessible Green Space – 4.6 acre Heron Rookery right outside your door! Urban roof top forest located on the 5th Floor. Public Transit – 67 trips within 0.5 mile. 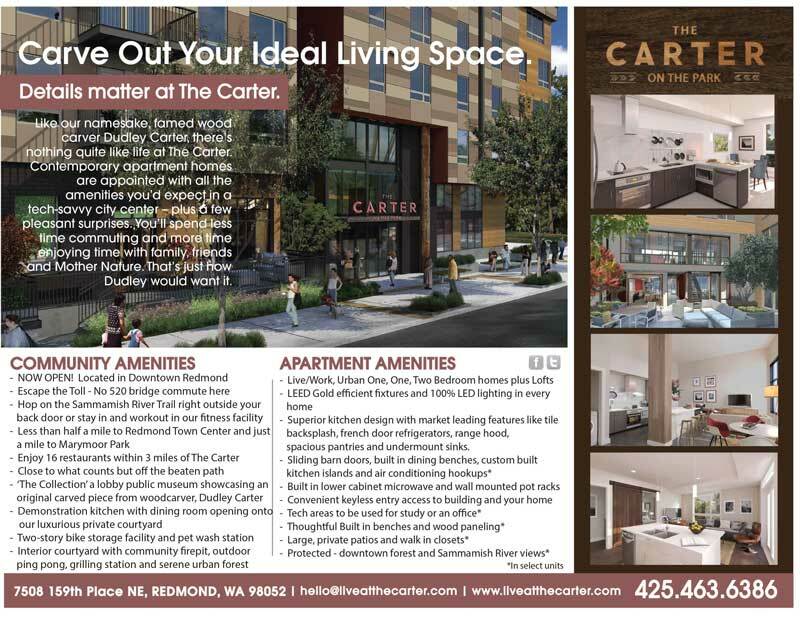 Central location – The Carter is only a minute’s walk from your daily necessities. Commitment by building ownership and management to educate building tenants and visitors about green features and benefits. Capability of electric-car charging station in the parking garage. Plentiful on-site bike storage available for each unit. Incorporation of on-site parking garage. Efficient Self-Service Coffee bar that saves trips to the café and uses minimal amounts of water and fair trade beans. Smoke-free community, protecting the health and safety of our residents, visitors and team members. Excedes Base Code Energy Performance by 17% – LEED for homes requirement is 15%. Enhanced ventilation system keeps common areas fresh and free of mold, allergens. Landscaping uses local plant life, drought tolerant plants and avoids the use of invasive plants. Naturally lit residential corridor lighting. High Water-Efficiency in bathroom sinks, toilets, showers, kitchen sink and appliances. LED lighting throughout the building, and in each unit. Carbon Monoxide monitor in each unit. Multiple Zones for heating system – one thermostat in each room reduces energy costs and creates a more efficient living space. Double-paned windows to enhance temperature control. Use of natural cleaners in units and in common areas. Hard-surface flooring in all unit living areas to reduce the amount of air pollutants and cleaning costs. Unit insulation and flooring are 3rd party certified as low-emission and safe for families. Unit materials (paint, coating, sealants, adhesives, etc…) are Low VOC (Volatile Organic Compounds), creating a healthy living space for all residents. Ventilation system filters air pollutants directly outside, creating no build-up of moisture or cooking oils, and a unit full of fresh air. Energy Star appliances which results in lower electric bills for tenants. An Abundance of natural light in all residences because of expansive windows. LEED-certified homes are designed to optimize fresh air indoors and minimize exposure to airborne toxins and pollutans. On average, LEED-certified homes use 20 to 30% less energy and water than a home built to code. Using fewer resources means lower utility bills each month. LEED-certified homes are third-party inspected performance tested, and certified to perform better than a conventional home. The ‘LEED for Homes’ Logo is a registered trademark owned by the U.S. Green Building Council and is used with permission.